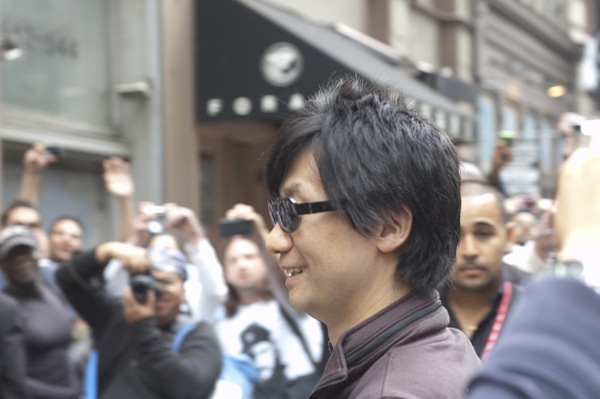 Friday was the much anticipated event for Mr. Hideo Kojima’s appearace at UNIQLO Soho. 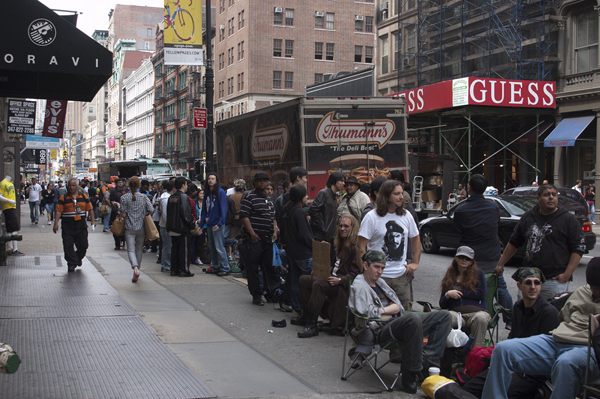 The turnout was amazing with over 700 people queued front from the storefront which wrapped around Spring St, turning into Crosby Street down to Prince St! This turnout was much longer than the event from 2 years ago! We had many dedicated fans show. 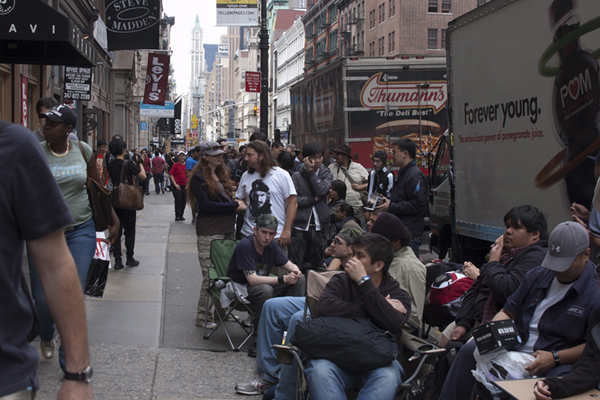 The first two on the line were brothers who came all the way from Florida and waited from the day before. 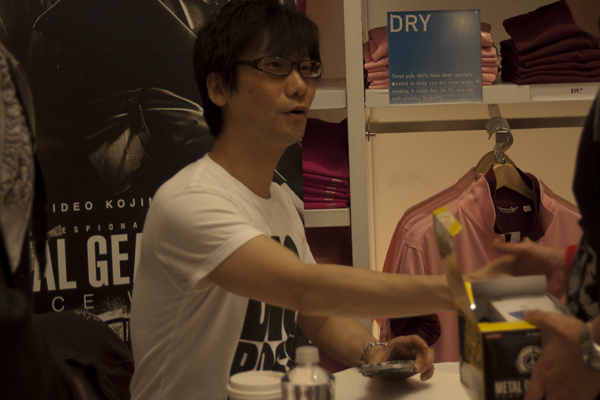 At around 12 noon, Mr. Kojima arrived at Uniqlo in a yellow limo and entered through the front where fans shouted in joy. 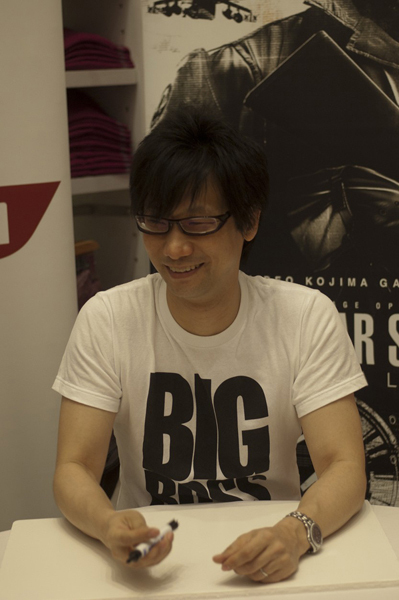 The autograph session was held on the mezzanine with MGS: Peace Walker sound track music accompanying the atmosphere. 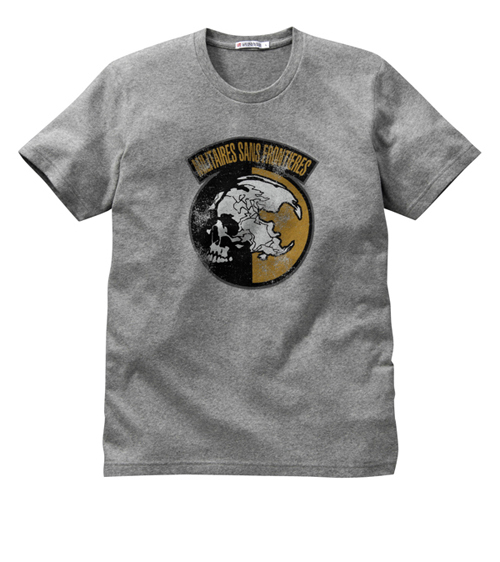 UT-MGS t-shirts were displayed in the center of the store. 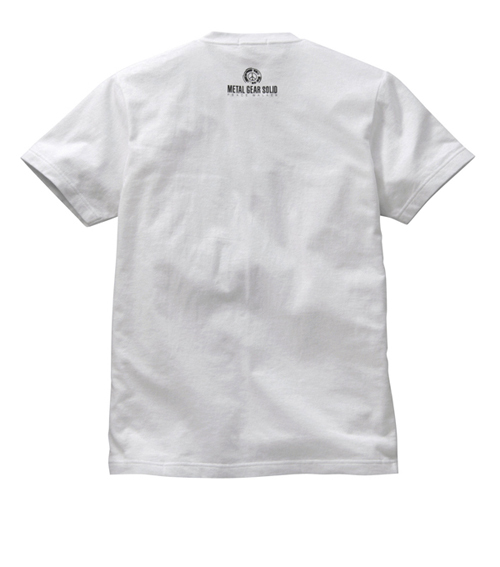 There were many people who couldn’t get their hands on the tees from the previous event. There will be plenty to go around this time around. Many from Konami Japan and Konami US were present including the US president Mr. Hirano. 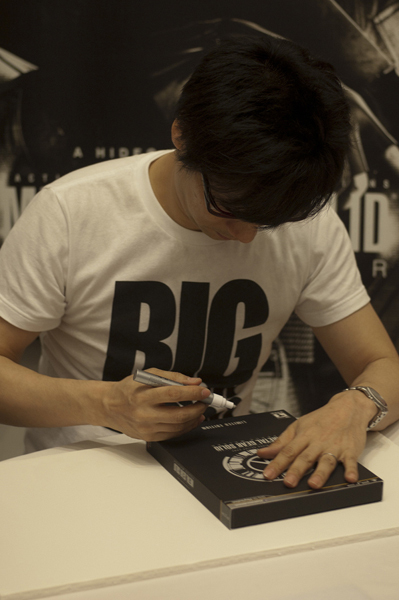 After the autograph session, the MGS crew left for Best Buy for another autograph event. An autograph session in LA and E3 followed these events! 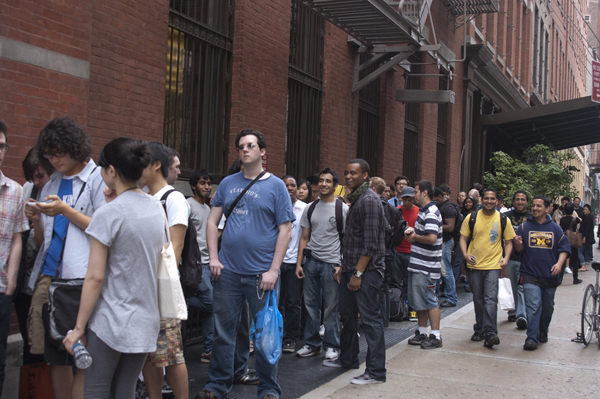 After E3, an upscale event in Paris will await them. 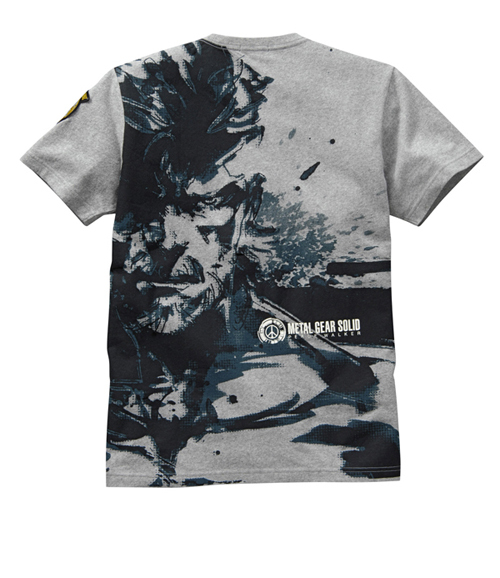 Konami‘s METAL GEAR SOLID®: PEACE WALKER is the latest from the world’s most prized icons to be featured in the beloved UNIQLO UT T-SHIRT Program. The Collection will be available in UNIQLO Stores and Online beginning June 11th, 2010. 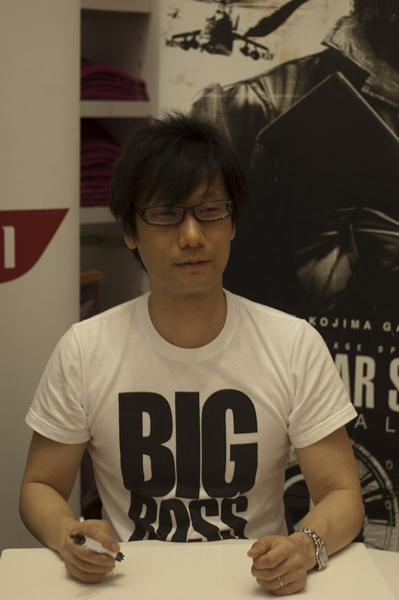 Legendary METAL GEAR SOLID® creator Mr. Hideo Kojima will be signing autographs at the UNIQLO Global Flagship Store in New York on June 11th. 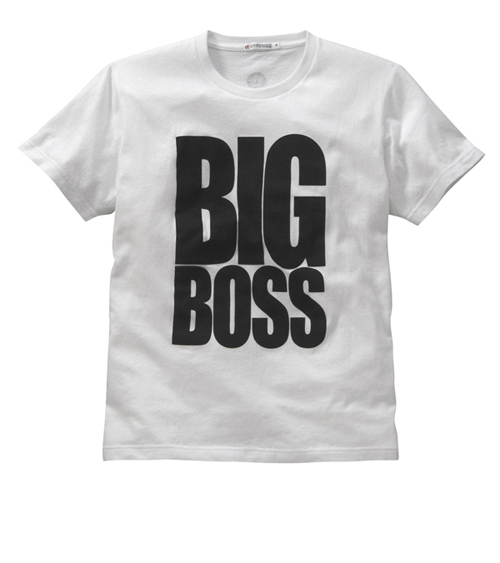 Check out the tees by UNIQLO below. RSVP now! UT x MGS:PW! 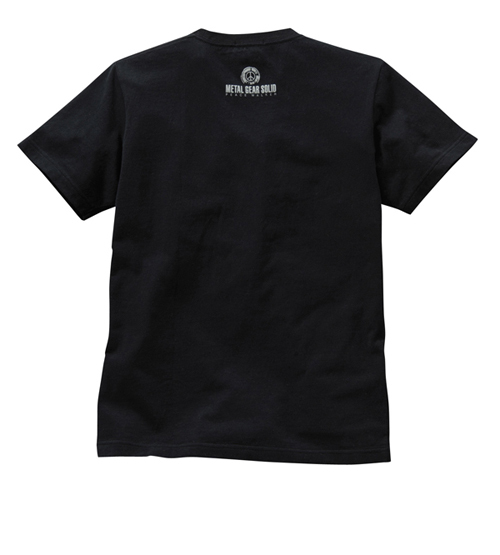 KOJIMA @ UNIQLO ON JUNE 11! 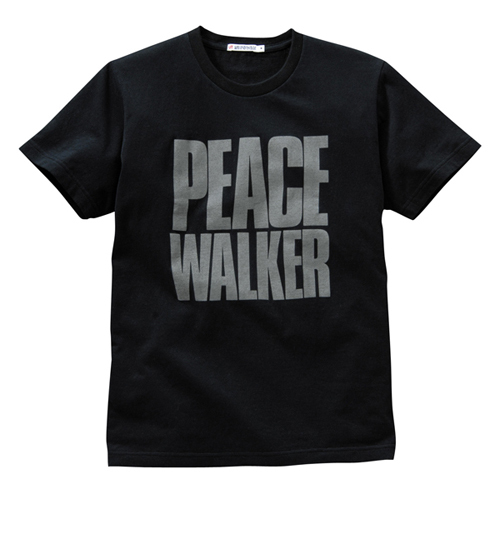 Konami‘s METAL GEAR SOLID®: PEACE WALKER is the latest from the world’s most prized icons to be featured in the beloved UNIQLO UT T-SHIRT Program. 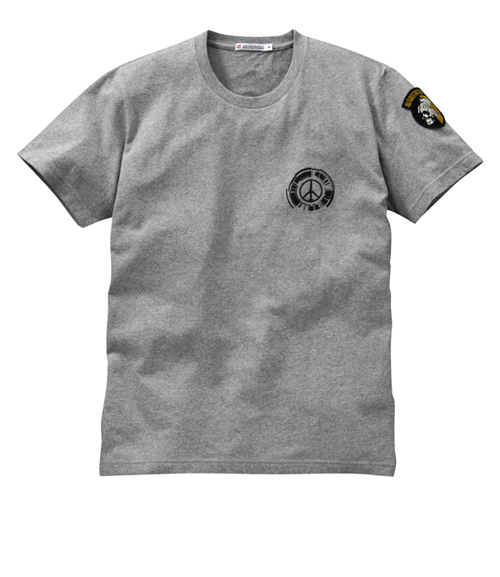 The Collection will be available in UNIQLO Stores and Online beginning June 11th, 2010. 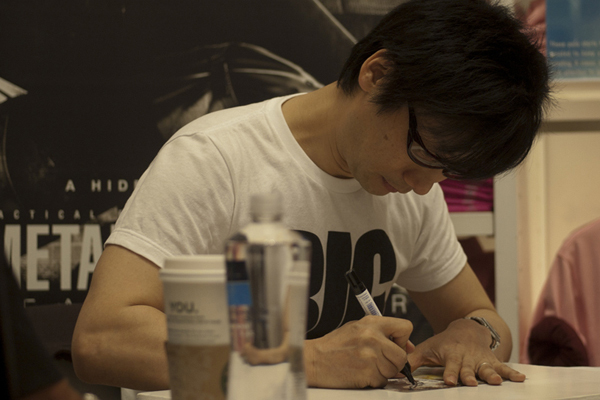 Legendary METAL GEAR SOLID® creator Mr. Hideo Kojima will be signing autographs at the UNIQLO Global Flagship Store in New York on June 11th. El Segundo, Calif. – May 11th, 2010 – The worlds of gaming and fashion collide as Konami Digital Entertainment, Inc. announced a partnership with Japanese clothing retailer UNIQLO Co., Ltd. to produce an exclusive collection of limited edition t-shirts inspired by the upcoming game METAL GEAR SOLID: PEACE WALKER for the PSP® (PlayStation®Portable) system. 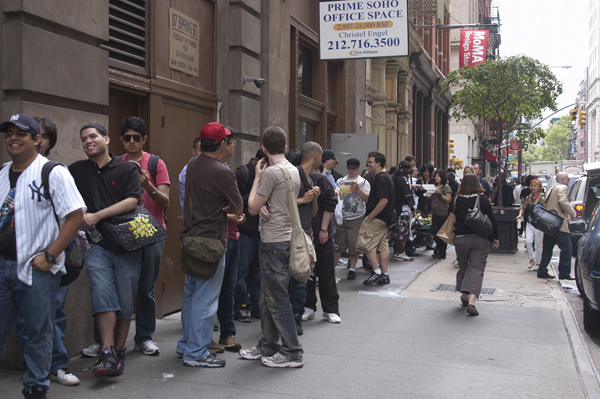 This line is the latest from UNIQLO USA’s UT Project (UT is short for UNIQLO t-shirt), which consists of limited edition collections of t-shirts designed by renowned artists, designers, photographers, and musicians created to allow people to express themselves through fashion and wear what they love. 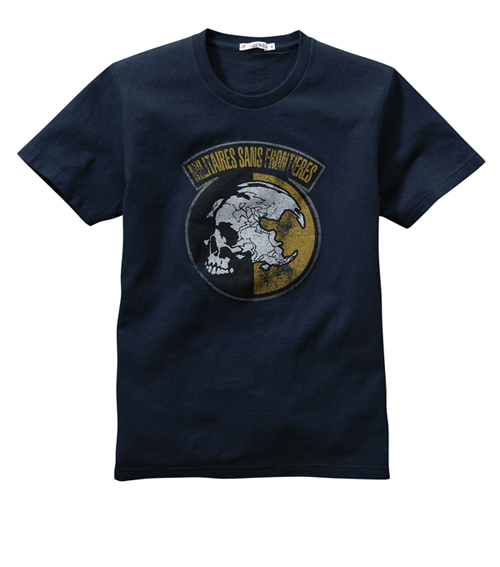 The two companies had previously collaborated with a collection of METAL GEAR SOLIDâ4: GUNS OF THE PATRIOTS t-shirts just prior to that game’s release in 2008. 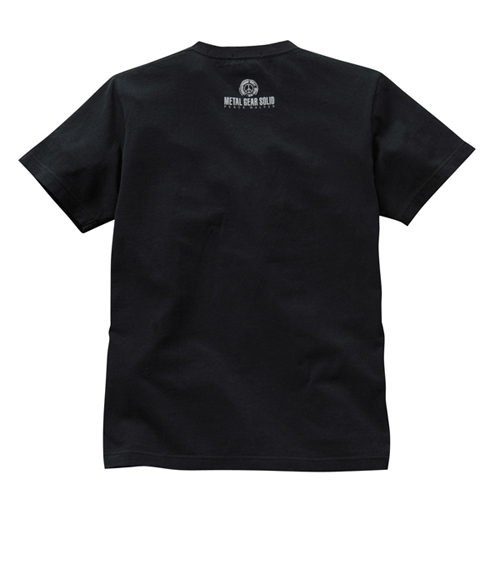 The collection will feature 10 exclusive t-shirt designs displaying images and themes from the upcoming game, and will be available in all UNIQLO USA stores and online starting on June 11th, 2010. 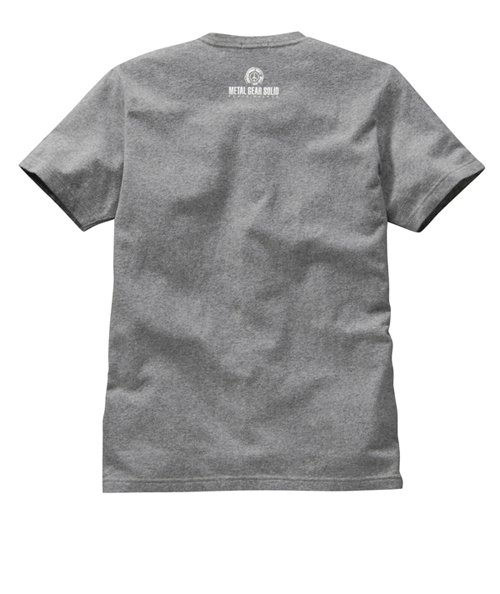 Each t-shirt will also come with a special code that, when entered, will give fans access to both the same t-shirt of purchase as well as a soldier in the game. 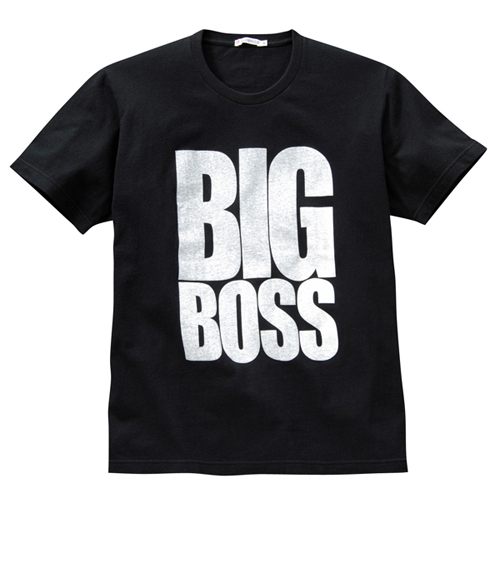 With the new line, fans will once again be able to show their METAL GEAR SOLIDâ love as they anxiously await the latest release in the best-selling franchise! 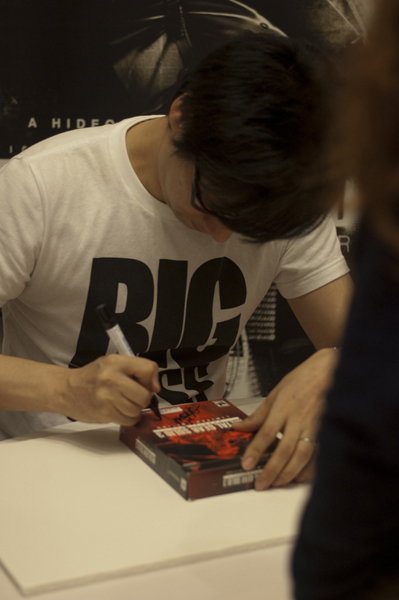 To celebrate the launch of this collection, Mr. Hideo Kojima – the man behind the highly-acclaimed METAL GEAR SOLIDâ series – will be greeting fans and signing autographs at the UNIQLO USA’s Global Flagship store in New York City on June 11, 2010 from 12:00 PM to 2:00 PM. 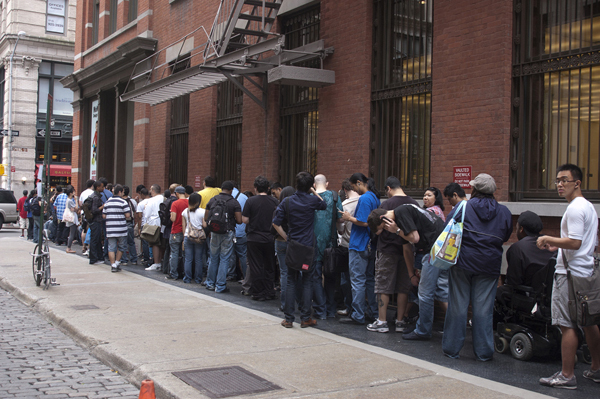 Additionally, UNIQLO will be giving away prizes such as a Sony PSP entertainment pack bundle, collector’s edition software, copies of the Artbook, and coversheets of the game. PSP® (PlayStation®Portable) system in mind. METAL GEAR SOLID: PEACE WALKER is developed exclusively for the PSP® (PlayStation®Portable) system. 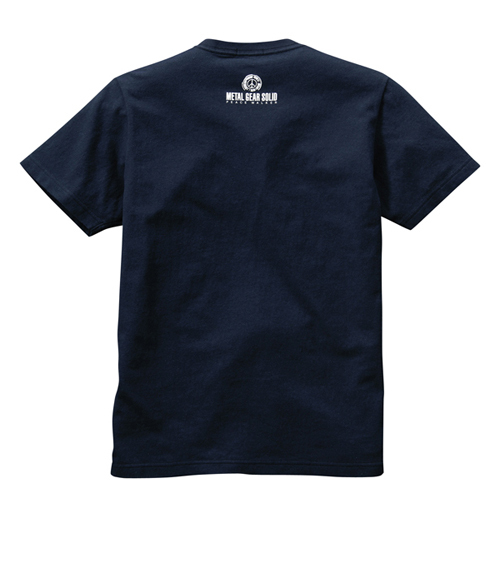 For more information, please visit: www.konami.com.